If your home or business is affected by timber decay problems, H+R can offer valuable advice and effective treatment options that are environmentally friendly. We’ve been surveying older and historic buildings for over 30 years, and can offer solutions to remedy and control timber decay as well as other types of insect decay and fungal decay in buildings of all ages. The use of our environmentally friendly remedial solutions to combat insect attack and fungal decay along with subsequent building monitoring systems allows us to effectively control acute problems while also offering long-term protection for your building. Our non-destructive property survey techniques include the use of Rothounds® – air scenting search dogs that have been specially trained to detect active timber decay – as well as fibre optics and several other electronic precision measurement techniques and equipment. We offer competitively priced rates for investigating timber decay in buildings. Furthermore, our recommendations do not include the use of chemical treatment, meaning that significant cost savings on remedial work can be obtained. Our final report will include detailed information about the extent and causes of timber decay in the property. Our recommendations for straightforward environmental control measures will give you the tools to control timber decay both now and in the future. Provided that any remedial work is carried out to our specifications, H+R will provide a 30 year guarantee against timber decay. For your ultimate peace of mind, we are protected by professional indemnity insurance. 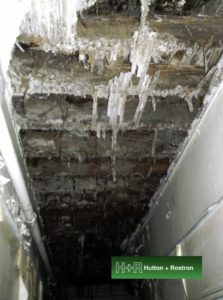 Our recommendations focus on remedial building work that effectively deals with moisture ingress, moisture distribution and ventilation levels to get rid of the environmental conditions that are conducive to timber decay and fungal growth in buildings. These building works techniques can then be undertaken by a local competent builder or non-specialist general contractor. After the timber decay remedial repair works have been completed, we sometimes recommend the installation of our H+R Curator® system. The use of this system allows moisture content parameters to be monitored remotely, so that any building defects or building failures can be detected at the earliest stage. Our monitoring systems bring to light useful data that can then be used to reduce insurance risk and as a basis for building maintenance and planning. In that way, our monitoring systems serve as a powerful new building maintenance and management tool that can achieve substantial cost, material and time savings for both property owners and building professionals.